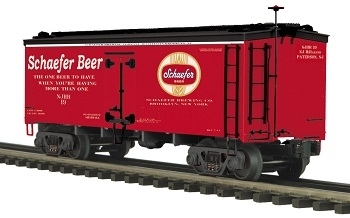 The NJ Hi-Railers are happy to make available the fourth in our series of exclusive beer club cars, two Schaefer Beer 36’ Woodsided Reefers. They are available as two different car numbers, 19 & 21. Delivery is expected direct from MTH in January 2019. Car Details May Differ Slightly From What is illustrated. Schaefer Beer is a brand of American beer first produced in New York City during 1842 by the F. & M. Schaefer Brewing Company. The company relocated to Brooklyn in the early 20th century. It went public in 1968 with a $106 million stock offering. In the mid-1970s, Schaefer Beer was one of the top selling beers in the U.S., ranking as high as fifth in both the 1950 and 1970 rankings. Though it was producing more than twice as much beer in 1970 the gap between it and the top national brands was dramatically widening. Recognizing the handwriting on the wall, the Schaefer family sold out to the Stroh Brewery Company in 1981. Stroh's then took over the Allentown plant in its own bid for national market share. It operated the plant until absorbed by Pabst Brewing Company in 1999. When Pabst opted to become a "virtual brewer" it sold the plant to Diageo just two years later. In 2008 Diageo sold it to the Boston Brewing Company, brewer of Samuel Adams beer. Pabst retained the license to Schaefer and today outsources a reformulated brew it labels "Schaefer" and sells in niche markets in the United States. Schaefer beer had major exhibitions at both of New York City's World's Fairs, held in Flushing Meadows Park. During both the 1939 New York World's Fair and the 1964 New York World's Fair, Schaefer sponsored "Schaefer Center", a restaurant that used beer as an ingredient in many dishes. Schaefer was the official beer sponsor of the Brooklyn Dodgers from 1951 until the franchise's departure for Los Angeles following the 1957 season. During that span, one of its advertisement was featured at the top of Ebbets Field's scoreboard on the right-field wall. The letters "h" and "e" on the wordmark lit up depending on whether the official scorer ruled that a batter reached base on a hit or an error respectively. Foxboro Stadium, the home stadium of the New England Patriots from 1971-2001, was named originally named Schaefer Stadium after the beer company paid naming rights for the privilege, one of the earliest known examples of a stadium selling naming rights. After 12 years, the contract expired and the name was changed to Sullivan Stadium in 1983 (after the family that owned the team). MTH Premier O Scale freight cars are the perfect complement to any manufacturer's scale proportioned O Gauge locomotives. Whether you prefer to purchase cars separately or assemble a unit train, MTH Premier Rolling Stock has the cars for you in a variety of car types and paint schemes. Many of MTH's Premier Rolling Stock offerings can also operate on the tightest O Gauge curves giving them even more added versatility to your layout. The NJ Hi-Railers are happy to make available the third in our series of exclusive beer club cars, two Piels Brothers 36’ Woodsided Reefers. They are available as two different car numbers, 20 & 18 to mark the year of their production. Delivery is expected direct from MTH in April 2018. Piels Beer was founded in 1883 by the Piel brothers: Gottfried, Michael and Wilhelm Piel. It was originally brewed in the East New York section of Brooklyn, New York, at 315 Liberty Avenue. Piels was on the cutting edge of new technology in their brewing process and many other European brewers visited the Piels brewery to learn the latest advances. In the 1950s, the Piels brewery had a very successful television and radio campaign when the Young & Rubicam ad agency created Bert and Harry Piel, the fictitious animated owners and pitchmen for the brewery. Voices were provided by the comedians Bob and Ray. Harry (Bob Elliott) was tall and soft-spoken, always calming down the short loudmouth Bert (Ray Goulding) when something went wrong. The first Bert and Harry commercials aired December 1955 and ran until 1960. In the 1950s, Piels expanded greatly. In 1951, Piels bought Trommer's beer in Bushwick, Brooklyn, and in December 1953 the company bought the plant of Rubsam and Hormann in Stapleton, Staten Island, plus the R&H label. Both of these were shut down in 1963. On September 20, 1973, the Piel Bros. plant in East New York was closed down after 90 years of operation. F. & M. Schaefer Brewing Company, another Brooklyn based brewer bought the rights to the Piel Brothers label and Schaefer continued to brew it at its Brooklyn and Allentown, Pennsylvania, plants. In the late 1980s, Schaefer was subsequently bought out by Stroh Brewery Company of Detroit, Michigan. Under Stroh, Piels sales stabilized for a time, thanks to new and improved package designs and good point of sale advertising. However, Stroh succumbed to marketing pressure from industry giants, Anheuser-Busch and Miller, and threw in the towel after 149 years in business. Most of the Stroh brands, including Piels, were sold to Pabst Brewing Company. Pabst discontinued manufacturing Piels as of April 2015. The NJ Hi-Railers are proud to make available a Rubsam & Horrmann Brewing Company 36' Woodsided Reefer. It is available as two different car numbers, 185 & 2003, which celebrate the club's street address and the year it was founded. R&H was a Staten Island based brewer that operated from 1870-1953 when it was bought out by the Piels company. The coming of the railroad changed the way America ate and drank. Before the iron horse connected every town of any importance to the outside world, most food was grown or produced locally. The arrival of cheap, fast, refrigerated transport - in the form of the woodsided reefer with ice bunkers at each end - enabled local brewers, diaries, meat processors, and other food businesses to become players on a national scale. Until 1934, shippers could advertise their wares on leased billboard reefers, each a hand-painted traveling work of art. That year, the Interstate Commerce Commission outlawed the flamboyant paint schemes because the cars often hauled shipments from other companies - whose freight bills thus unfairly paid to advertise the lessee's products. What doomed the billboard cars was truth in labeling. Depending on shipping needs, billboard cars often carried loads for customers other than the company named on the car sides. A beer company requesting an empty reefer for loading, for example, might find a cheese maker's delivered to its door. Shippers were not happy when their product was carried in a car bearing a large ad for someone else's product - they complained that their freight bill had in part paid for another company's advertising. 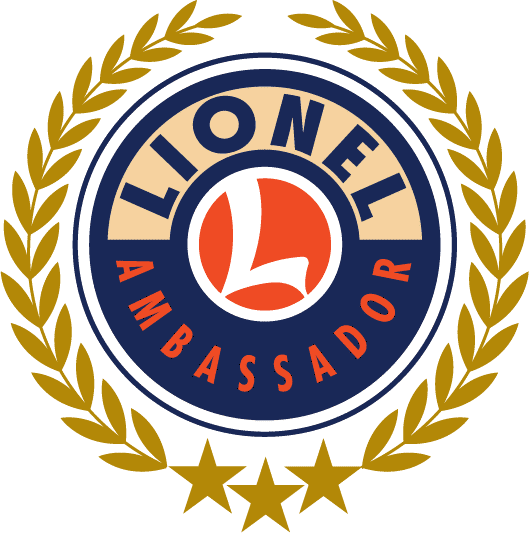 Responding to these complaints, the Interstate Commerce Commission in July 1934 mandated the phasing out of billboard reefers and ruled that thereafter, the lessee's name on a car could be no more than 12" high. By law, all billboard reefers were removed from service by January, 1937, although many soldiered on in drabber paint schemes as late as the 1960s.